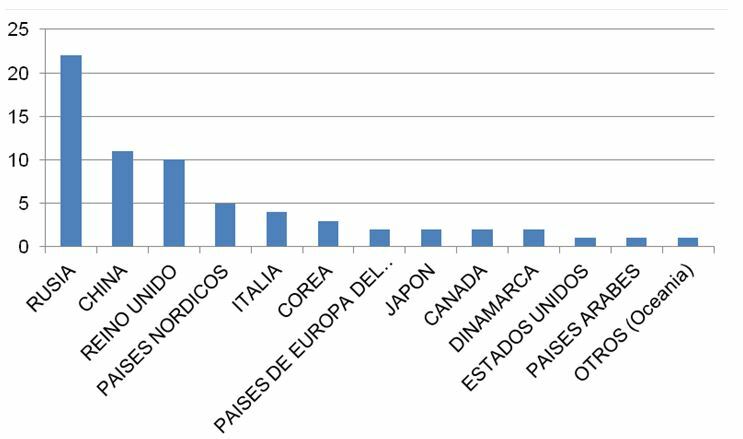 FEDELE (Spanish Federation of Schools of Spanish as a Foreign Language) has released its 2012 Informe Sectorial, or Sector Report, which was built from surveys conducted between January and April 2013 and contains some of freshest data available on Spain’s language sector. 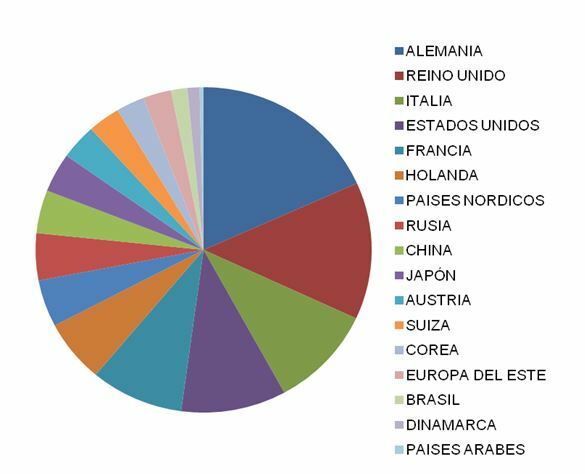 The survey does more than look at growth and demographic data for FEDELE’s schools – it also asks for opinions about Spain’s international education sector from the survey’s respondents (school directors) from across the country. Top-line results reveal an increase in student weeks and revenue in 2012, driven by growth from Russia and China as sending markets, which compensated for declines from other nations, namely Denmark. Small and medium-sized schools fared better than larger institutions. Below, ICEF Monitor translates, examines, and puts FEDELE’s data into context. Before getting into the survey, here’s some quick information about FEDELE that will help in interpreting the information: FEDELE’s main objective is to promote quality teaching of Spanish in Spain. It consists of six associations totaling 88 private Spanish schools. Five of the associations are named for five of Spain’s autonomous communities, and their schools are located in or near those communities. FEDELE Barcelona, which has 7 schools, all located in Barcelona. 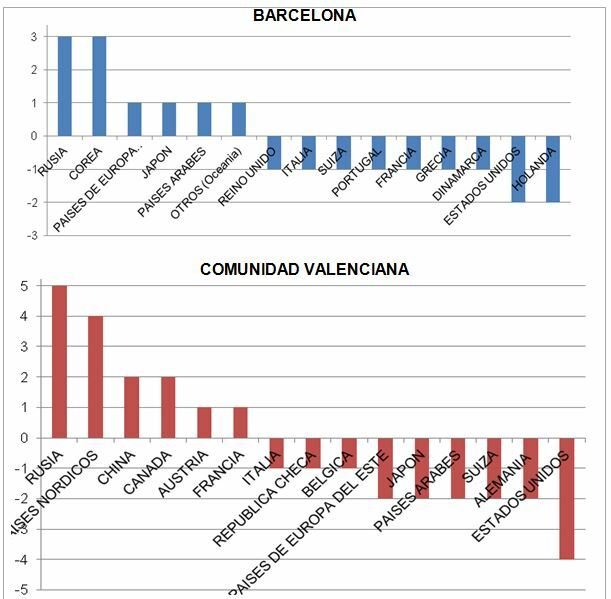 FEDELE Comunidad Valenciana, which has 13 schools, located in Alicante (3), Castellón (1), and Valencia (9). FEDELE Madrid, which has 13 schools, all located in Madrid. Asociación Español en Andulacía, or AEEA, which has 33 schools located in Cadiz (7) Granada (6), Málaga (13) and Seville (7). Asociación Español de Español de Castilla y León, or AEECYL, which has 14 schools in Avila (1), Salamanca (12), and Valladolid (1). AELE, which has 8 schools located in A Coruña (1), Guipúzcoa (1) the Balearic Islands (2), Marbella (1), Navarra (1), Santa Cruz de Tenerife (1), and Biscay (1). Of the 88 schools, 50 took part in the survey, and FEDELE states that it is extrapolating data from this sample size to apply to the whole association. In a similar vein, FEDELE’s figures apply only to its collection of private schools, and may not perfectly correlate with data for other types of language schools in Spain. The FEDELE survey uses a measure based on enrolment weeks to show the size of its schools, the growth trends per region, and the demographic makeup of the students. The entire survey is of interest, but we’re going to jump to the middle and start with the demographic information that will be of greatest interest to recruiters. 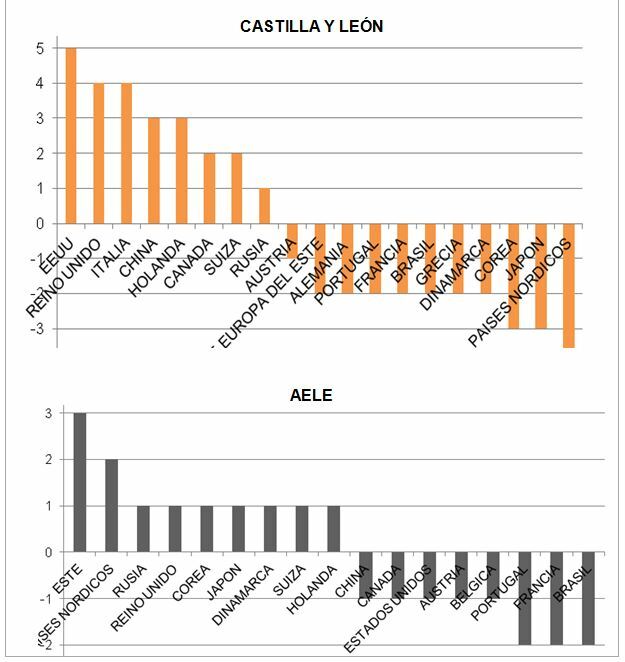 The graphic below reveals which countries or regions send students to FEDELE Spanish schools and in what proportions. Most of the Spanish country names are self-explanatory, but a few to note are Alemania (Germany), Reino Unido (UK), Corea (Korea), Europa del Este (Eastern Europe), Suiza (Switzerland), Paises Nordicos (Nordic countries), and Paises Arabes (Arabic countries). The charts below break the data into FEDELE’s sub-regions. FEDELE does not group Dinamarca (Denmark), seen in both the chart above and those below, with the Nordic Countries, though it is in fact Nordic. The data was collected not by surveying actual student numbers, but by asking the institutions to indicate the top five nationalities of their enrolees. This methodology made for some revealing results, which we see below. The list shows which countries or regions were top five senders for FEDELE schools. In other words, 94% of the schools reported Germany as one of its top five sending countries, and so forth. FEDELE also asked its schools which nationalities showed the fastest growth in 2012, and which showed the steepest decline. The methodology was the same – i.e., the results shown refer to the percentage of schools that included these nationalities in its response. FEDELE doesn’t include 2011 charts for comparison, but reveals that as a sending market, China has fallen two places since last year. However, respondents still ranked China highly, which indicates merely a downtick in what remains an upward trend. ICEF Monitor reported last month that about 25,000 Chinese students are currently studying Spanish in Spain, a number representing a huge increase compared to ten years ago. Spanish language instruction within China is also up, with 35 Spanish academies now operating in Beijing, and 90 universities offering Spanish courses. The change shows both the increased importance of Spanish in global markets, and also the increased competition that FEDELE faces. Notably, the Nordic Countries are up as senders, but Denmark shows a marked decline. Also Germany, while remaining the top sending market to FEDELE schools, did show a slight decline. The differentiated charts appear below and reveal sharp variation between countries. For example, the US is down as a sender to the Valencian region located on Spain’s eastern coast, but up to Andalucia in the south. 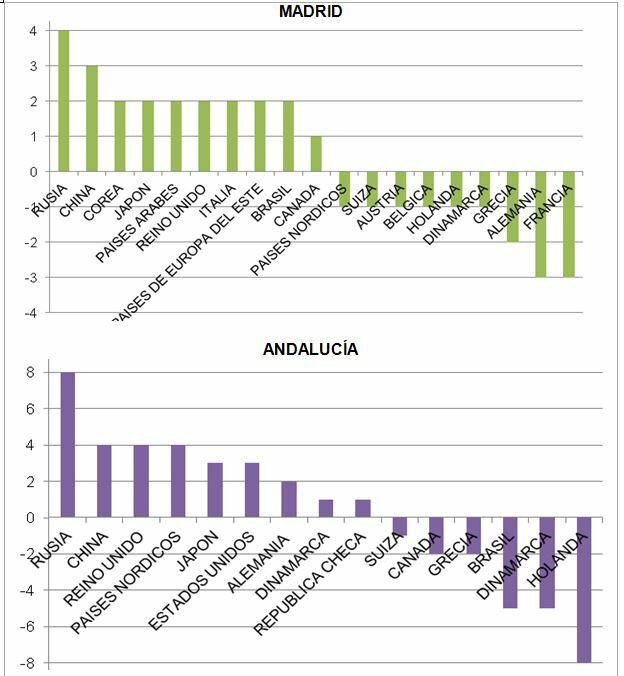 Similarly, the Nordic Countries (minus Denmark) are up to Andulacia but sharply down to Castille and León. As stated earlier, the survey uses a measure of volume based on enrolment weeks to show the size of its schools. Thus we see that 48% of the schools are classified as small, 30% are medium, and 22% are large. 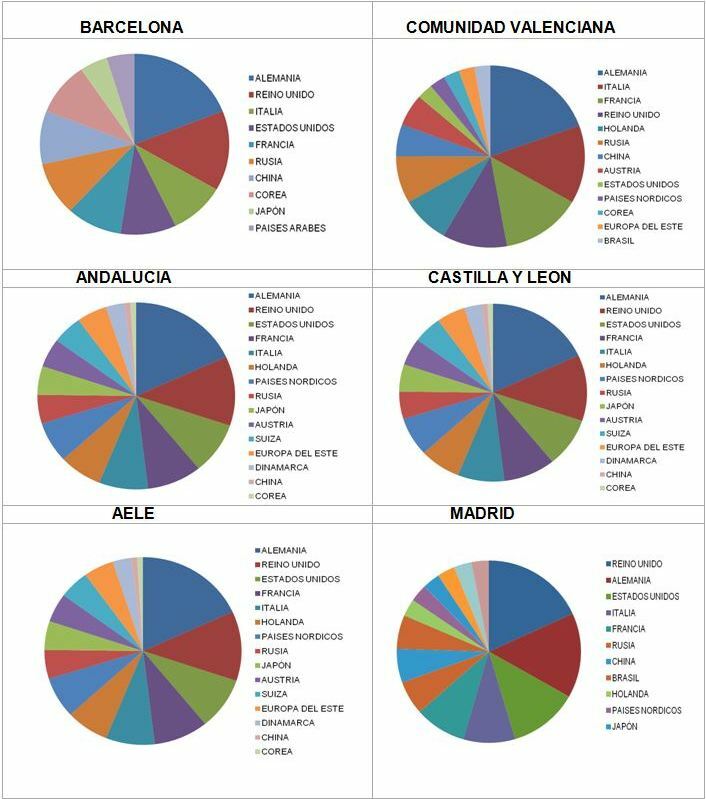 Spanish schools in the Barcelona and Madrid regions tend to be large, while schools tended to be small in Andalucia in southern Spain, Castille y Leon in the northwest, and in the widely scattered AELE grouping. Interestingly, the data also showed that while numbers were generally up, the schools showing growth were small and medium schools, while the large schools that responded to the survey showed a tendency to decrease. Next we see a comparison between 2012 and 2011 weeks/student to get a sense of the growth rate of the schools. FEDELE’s metric “weeks/student” does not measure actual numbers of students, but rather enrolment weeks. Below is the specific data, which shows that as a whole FEDELE schools grew from 136,100 weeks/student in 2011 to 160,250 weeks/student in 2012. 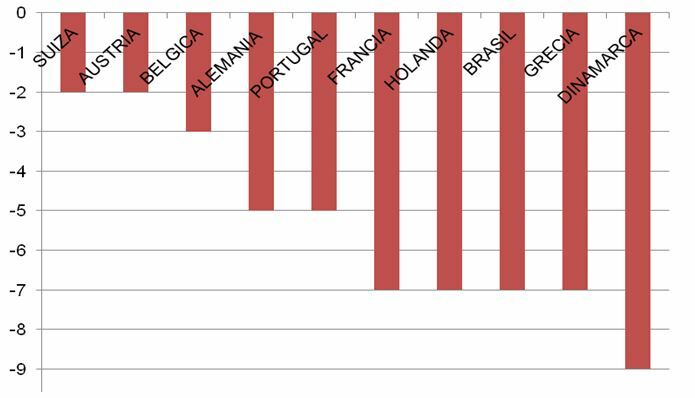 FEDELE’s data set confirms the increasing global demand for Spanish language instruction and the continued resiliency of Spain’s language sector. However, the concerns of FEDELE school directors paint a vivid picture. Even in the midst of growth, they feel that their strength with traditional sending markets is declining. Education providers may do well to focus on new sending markets and refine their marketing strategies, perhaps concentrating on untapped customer segments, as outlined in the British Council’s Spain Country Brief. This entry was posted in Europe, Language Learning, Regions, Research, Spain and tagged study abroad in Eastern Europe, student visas, language schools, student recruitment, study abroad.